Abu Dhabi : Thirteen driverless cyber taxis will be on the ground in the UAE by month's end with more on the way for the $22 billion (Dh80.7 billion) zero-carbon Masdar City later this year, says Netherlands' manufacturer 2getthere. The environment-friendly city on the outskirts of Abu Dhabi is expected to rely on up to 3,000 of the electric cars to shuttle residents daily - fossil-fuel vehicles will not be allowed inside the six-square kilometre city. Once inside the vehicle, passengers simply tap their finger on the selected touch screen showing city destinations and the electronically guided car will drive autonomously. The cars are guided by an onboard system that recognises metal chips embedded in the asphalt streets for direction and destination. A Maserati-white production model lined with Porsche Cayenne leather interior was displayed much to delegates' enthusiasm at the World Future Energy Summit which wraps up on Thursday. 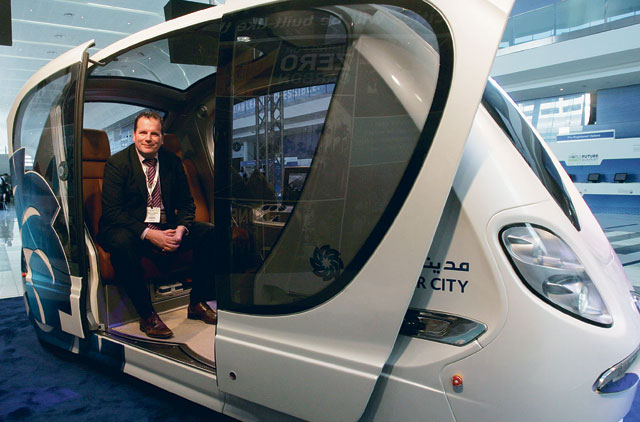 Robbert Lohmann, Marketing Manager of 2getthere, said public interest in the future of the personal rapid transportation (PRT) vehicle is very high. "This will be the only car-like transportation within Masdar city," Lohmann told XPRESS. "These cars will run 24 hours a day, seven days a week. The future is now. It's straight out of the Jetsons and there is no need for fossil fuel vehicles." In Masdar's infancy, more than a dozen vehicles will run between a small number of stations, but the Masdar design calls for at least 90 PRT passenger stations. Stations will be strategically located so that passengers needn't walk any further than 250 metres to reach their destinations. Lohmann said each vehicle can carry four adults and two children at speeds of up to 40km/h. Thanks to lithium batteries, cars have a 60-kilometre range and can recharge in two hours. "The cars can drive continuously for five hours between recharging," said Lohmann.